But with Dawn of the Planet of the Apes arriving this week, I get the chance to fill this gap in my knowledge! First things first, it turns out there’s a lot more Apes movies than I thought! 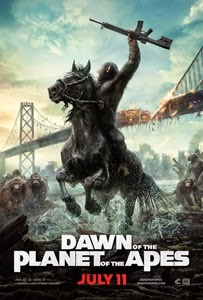 That, and Rise of the Planet of the Apes may seem like a long title… but it is in keeping with the series’ continuity! The one great thing about remakes and pre/sequels is I get to watch some classics I’ve never actually seen. Better yet is when the classic still stand the test of time! 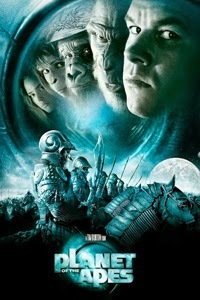 A team of astronauts flying a faster-than-light spacecraft crash upon a mysterious planet where mute, timid human-like creatures are enslaved by intelligent talking apes. The lead pilot George Taylor is then studied by the curious apes; his ability to talk and show intellect challenging their understanding of their society and history. I was actually afraid to watch the original Planet of the Apes until now, not just because of how it may have dated (a film’s age doesn’t bother me, it can still amaze if made well enough) but because I knew the twist ending. Who doesn’t by now? It has been referenced and parodied over the last four decades. But I really enjoyed the film! It has a surprising depth to it as our characters explore a multitude of philosophies from social, environmental and even religious issues. Also having watched 2011’s Rise of the Planet of the Apes first, there are direct references between the two that I was not aware of before, also increasing the film’s (and more importantly the franchise’s) depth significantly! It has a great sense of atmosphere; often perilous and full of danger, and has landscapes that show barren expanses as far as the eye can see. Plus some of the stunt work is incredible and alarming to watch. There was some dissonance from watching it nowadays and with the prior knowledge of the twist… I found it a little hard to believe that Taylor and the other astronauts didn’t consider what planet they had crashed on. They only knew that they were thousands of years into the future, nothing more. If I were on a planet that just so happened to have an exact human species, a breathable atmosphere, horses and ape species… I would have caught on to the possibility long before the twist! I think if the initial setup had suggested humanity had colonised other planets, or may have in the time the crew had been in stasis sleep. But this didn’t detract from my enjoyment of the film as a lot of it could be put down to retropective viewing and knowing the ending ahead of time. Overall, I really liked it; it certainly is a milestone of science fiction and considering I knew the twist it is doubly impressive that I still found it compelling for other reasons. If you haven’t seen it, I suggest that you do! Just get over the monkey-makeup first and appreciate the characters behind them! A sequel with its potential squandered by massive budget cuts and the questionable future of the franchise. It has its moments, but comes across as more like a traditional science fiction action movie without its predecessor’s intellectual gravitas. 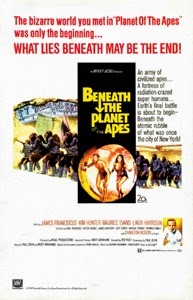 In an unlikely turn of events, two astronauts are sent to find the lost George Taylor and find themselves thrown through the same time shift, arriving on the planet of the Apes. The lone survivor, Brent, meets Nova – the native girl Taylor had befriended – and they look for him together. However in their search they find the Apes are under a military upheaval, and that a society of native humans living beneath the surface are their target. Despite the success of the original film, its sequel’s budget was positively halved due to Twentieth Century Fox almost going bankrupt (that is almost hard to imagine today!) due to several expensive box office films that failed to make good returns. Charlton Heston’s role is very reduced, mostly since the actor showed little interest after the first film. Here is the first problem. The film opens with yet another space craft crash landing on the planet, and once again we have a lone hero discovering where he is. It really feels like the film wanted to continue with Heston’s character straight off the back of the first film, and as it stands it is a little tiresome to get into at first. 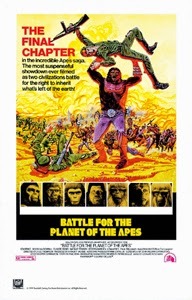 The apes characters are still good; Kim Hunter returns as Zira and Maurice Evans as Dr Zaius, I was sad to see that Cornelius actor Roddy McDowall did not return, although he and Hunter weren’t as prominent in this story. The film still has a good sense of pacing despite what budget cuts might have done to the screenplay, the film flies by with its involvement of exposition; there’s less time for philosophy here. We have our hero Brent discovering a world of telepathic humans who have used illusions to avoid detection from the apes above ground, yet they are little better than the apes, depicted as religious fanatics. This is probably the most intriguing part of the film and builds nicely off the back of what we learned from the first film. I was further intrigued by the history of this planet. They continue some alarming physical stunts in the films too! At one point a man mounted on horseback is pulled to the ground by a net, but the horse goes down with him, falling virtually on top of the man! What kills the film though is the ending…! It was doing well considering its flaws and narrow scope, but then everything just stops. Disappointing and a little bewildering. It is far from the first film, it is more of a chase film with a few notable flaws occasionally, but if you enjoyed the first film there’s enough continuity to make this one worth a watch too. So from the moment of reading this film’s synopsis, I was very worried… and while it could have been worse I do find that the series has finally cheapened itself in this installment. Ape scientists Cornelius and his pregnant wife Zira escape the presumed destruction of their world by using Taylor’s crashed spacecraft. But though similar mishap that befell Taylor, they find themselves thrown back in time, back to 1973 Earth. 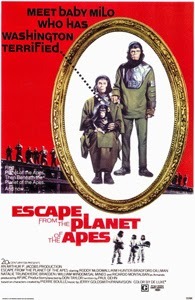 Escape from the Planet of the Apes is, by its very premise, the first film in the series to be taking style over substance; here we have the budget answer to sci-fi by just plonking your character into contemporary surroundings without taking the time of explaining how. The films have never explained exactly what causes these spacecraft to time travel, but Escape tells us that these advanced craft – with their stasis beds and faster than light engines, as described in the original film – were conceived and launched in the late 60s early 70s, since the Government officials in 1973 know of George Taylor and Brent. Do I… need to explain how stupid that sounds? Perhaps a failing on my part, but I assumed Taylor originated from a future society of man, one capable of interstellar travel! And that’s ignoring the fact this film glosses over how these Apes repaired and restored either of the two destroyed spacecraft. 1970s humanity however appear to like and have a fondness for our ape heroes, and rightly they should; Kim Hunter again plays Zira and happily Roddy McDowell reprises the role of Cornelius! The first act of the film though is gratingly saccharine. Gone are the moral and philosophical implications, now we have the Planet of the Apes equivalent of the PG-Tips chimpanzee television adverts. We see them touring around the American cities, being measured for suits, going to boxing matches, a surreal moment were Zira leads a feminist meeting. Oh dear, the franchise can be seen withering and dying! But there is one man who sees between the lines, and questions what kind of world these Apes came from, what roles the Apes had with humans, and what the future holds. Eric Braeden plays Dr. Otto Hasslein, probably the most interesting character here as the embodiment of human paranoia and deceit. This takes up the greater portion of the film as doubt and distrust becomes an issue, the issue of atrocities that have and will take place, and yet the ultimate similarity between human and ape cultures. The film’s strength lies in its stark reality; these characters are now trapped in Earth’s past and have no means of escape. It isn’t a terrible film and by the end it does have its own strengths, and the characters are well maintained, but I cringe at the gimmicky premise and the exposition filled script that explains what we already knew. It is something of an “average” film. 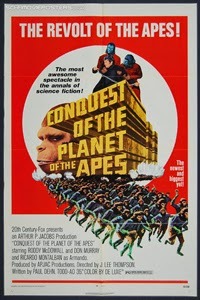 With a meager budget of $1,700,000 Conquest does its best to tell of the future uprising of the Apes, and the inevitable self-destruction of Man. By no means a terrible film, but sorely lacking in emotional involvement. Set about twenty years after Escape and the demise of Zira and Cornelius, this story follows their son, now named Caesar, and his discovery that humans have begun enslaving apes after their realisation that apes could one day rule the world. Sickened by these events, Caesar is spurred on to overthrow Man’s rule of Earth. Like with several of the Apes films so far, one could be confused by how the timeline works; the films rarely explain the issues of divergent timelines. Here, due to Zira and Cornelius’ intervention in Escape, the future that had been prophesied in the 1968 film has been accelerated. This film actually corrects a lot of the flaws I was seeing throughout Escape and feels more like a second part to that film than a sole experience. This film is only let down by a short runtime and minimal budget (it had $1million less than Escape did, and a fifth of what the original film had) so what should be a both traumatising and important event in the entire franchise falls quite flat in terms of emotional investment. We don’t get to know Caesar. He is played by his father’s actor Roddy McDowell, which is fine only as far as you can distance yourself from believing it is just Cornelius: voice and monkey mask are identical, and he has speeches like Cornelius and little development to distinguish himself from his father. As a result his uprising feels quite sudden. The leap of twenty years from an ape-loving humanity to an ape slave driving dictatorship is also hard to swallow and while Caesar has every right to act against it, his rising anger and madness feels hastened when the film’s runtime demands it. I also watched an edited version with an altered ending… I found the original ending on Youtube and greatly preferred it! The edit has been given a poor treatment: it is cleared dubbed and extended with little more than looped footage, and the scene’s mood and its original intention does not match the new dialogue and narrative given. There’s little worse than a detectable edit, especially one that sways the lead character’s story and the film’s conclusion! It is not a bad film (certainly better than Escape‘s silly gimmick) but it falls far from what grace it should have had with its slight studio backing. It is perhaps a testament to how good writing can override the restraints of a low budget. Additional Marshmallows: It should be noted that by this point I find the series remarkably strong willed in its convictions. It is determined to continue a good narrative despite the drawbacks it is continuously under; something film would only attempt some thirty years later. And so the original Planet of the Apes saga concludes with another rather lacking installment that suffers yet more continuity problems. Set only ten years after Conquest we see Caesar, his family and his human adviser McDonald overseeing a mutual peace between human and ape. While humans are not treated exactly as equals Caesar vows no harm to come to them. But the remains of human resistance in the Forbidden City sparks yet more war as the gorillas, led by Aldo, plan to overthrow Caesar. What can be said about the previous three films in the saga can be said about this film: the budget was once again sorely lacking, not even $2 million, and everything feeling woefully short in exposition. But even with the benefit of the doubt, like the previous films, Battle isn’t even well written like the others often were. Fantastic stuff, and Aldo appears in Battle as a direct opposition to Caesar’s peaceable nature but… the film (and in fact Conquest before it) took a major misstep. In just ten years, all apes have learned to talk! This makes Caesar, and more importantly Aldo and his prophecy, even less prominent! What does it matter if he says “No”, they could all speak. There were script re-writes, and older outlines of the story that speak of much darker content for Battle, and much like Conquest before it this film has that same sensation of doubt towards the production team. Which is really sad given the great potential this series has been building towards. Of course… one cannot deny that Zira and Cornelius spoke of their past (our future, by the time of Escape from the Planet of the Apes) and that their involvement changed history. That is a perfectly valid argument, one I have mentioned before, but sadly there is no narrative device in play to suggest this… in any of the previous three films! Furthermore, Battle has a contradiction proving this unwanted ambiguity. If Caesar is the x-factor that changes history, due to Zira and Cornelius, why then does he still employ the old rule of law: “Ape will kill no ape”, clearly excluding the humans he has sworn to protect? Clearly provoking one to fight the other. One can theorize Caesar’s motives, but they will forever remain muddy and unclear due to a lack of explanation. It is a sad note to end the series on, and perplexing. All four sequels were released within four years, how could things get so muddled and confused!? You wouldn’t think there would be time to rewrite scripts and screenplays. But by the end there were one too many changes that reduced the saga’s powerful initial message. Looking back at this retrospectively, remakes have had the same problems for years. 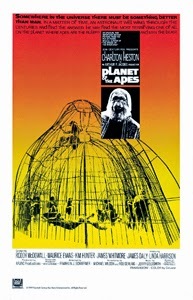 This Tim Burton directed remake re-envisions the original Planet of the Apes story: we see Leo Davidson (Mark Wahlberg) a pilot in our future training monkeys to fly spacecraft. But when one craft is lost in a temporal storm in space, Leo pursues it only to be dragged into a dystopian future were apes rule the world and humans are slaves. Can he return to his own time? The term “re-envision” can be used as a safeguard for this movie, because it is clear the team behind this film had no intention of honouring the original 1968 film! Burton’s film is a trashy, poorly edited and poorly written action flick, with none of the original’s intent or sincerity. Let’s look at Tim Burton’s filmography for a brief moment: Beetlejuice>Batman>Edward Scissor-hands>Batman Returns>Ed Wood>Planet of the Apes>Charlie and the Chocolate Factory>Corpse Bride>Alice in Wonderland>Dark Shadows. You could say PotA was the end of a flawless track record! Mark Wahlberg too is phoning in his performance, though one can appreciate this is early in his blockbuster career and he has yet to find the nonsensical gimmick he has now. He is positively unmemorable here. What is sad is how this film gets a few things right (shock horror!) I do like the ape make-up in this film, despite the casting making it more a game of Spot the Actor than any serious narrative, and Tim Roth’s villainous General Thade is great! Thade is possibly the only valid addition to the franchise this film gives. The music too. Danny Elfman puts his own spin on the Apes themes and it is has a great sound to it, without being generic Elfman sound. Set design also is very nice to look at with plenty of practical effects. But the film remains incredibly forgettable, a parody of what came before rather than any serious attempt at remastering the franchise. This film ignores the original’s themes, or at the very best it brushes them to the side as if irritated by the responsibility. Instead let’s have a chase scene that rampages through the homes of apes so we can see a silly, lurid cross section of their society. Sure, I am happy to see a “retelling”, or a new vision or interpretation of a story, but why do so many remakes blatantly ignore the themes and the moods of the predecessor?? Changing that changes too much, and what you get is a parody like this and not a remake! After watching the decline of the original saga, the terrible budget cuts etc, seeing this film with all its lush visuals, expressive ape characters and great music I feel extremely disappointed with everything else. The lack of inspiring characters, the absence of any story or pathos… the entire thing just gets monotonous. Additional Marshmallows: If it weren’t for Tim Roth’s Thade and Elfman’s music this film would be down in the gutter! This retelling of the initial events that started the race of intelligent apes has a quickfire pace equal to the speed of their evolution! 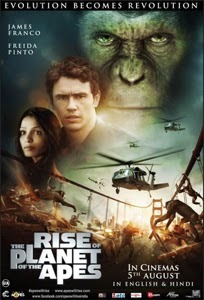 Set in contemporary America, Rise of the Planet of the Apes sees Will Rodman (James Franco) a scientist attempting to cure his father’s alzheimer’s disease by testing on various apes. In the process, a pregnant ape under the effects of the virus gives birth to Caesar, a chimpanzee with remarkable, accelerated intelligence development. You know, originally I had only seen Tim Burton’s remake before I saw this… and while I enjoyed it a great deal I don’t believe I gave it enough credit at the time. Watching them all and now Rise (days before Dawn of the Planet of the Apes) I can see a massive rejuvenation for the franchise! Rise does what very few blockbusters ever do; it is surprisingly subtle when it needs to be. While Franco’s performance brings reality to the premise’s conception, this film is ultimately about the apes themselves… and unlike the 1970s films, these are apes and nothing more… for now at least. It plays around with wonderful scenes both joyful and cruel to show the increasingly human intellect growing within Caesar; we see his thought processes through actions and the actions of those around him. While yes motion capture artist Andy Serkis derseves a lot of credit for the character’s energy, most of the film’s strength comes from the ironclad production decision: let the audience figure things out, don’t over explain. Caesar’s evolution is fast, and perhaps my initial reluctance was due to feeling left behind in the rush. But upon a second viewing I find the one-hundred minute long experience full of great nods to the original, and create subtle characterisation with the apes. These animals have bare minimal distinction, yet we know who they are and how they are each going to evolve. Very fascinating. In terms of technical achievement, this film makes us and the human characters really feel something for these computer generated creatures. While it doesn’t go into the heavy subtexts and social messages of its predecessors (that isn’t necessarily its function) it is incredible how faithful it is to its potential future and past successes. It does a lot with very little, and is a film with no wasted opportunity. It is the literal beginnings of the franchise, or at least a new vision of the beginning. There’s a lone shot of a television telling us of a space voyage to Mars that is in progress… and I’ve never seen a silent end credit sequence more loaded with narrative significance than here! I guess 20th Century Fox weren’t sure of the film’s success and treated this as a single experience with the potential to grow. What I am saying is: I left the film wanting more! Looking at the series as a whole, it isn’t surprising that it has been abandoned for so long. Twentieth Century Fox treated it extremely badly in the 70s due to their financial troubles (although one can’t imagine why they would produce four films in four years if they had such problems funding the series!) and Tim Burton’s indulgent time waster did not improve the opinions of young and old audiences that the series was salvageable. But with Rise, director Rupert Wyatt breathed new life into the series the only way left available to the studio at this point: a prequel. Feeling a little more like a formulaic blockbuster than its predecessor, Dawn still packs a heck of a wallop in action, emotion and intensity. Rise of the Planet of the Apes was unprecedented in its integrity and emotional weight, as well as its subtly when explaining its characters’ complexities. In the sequel ten years have passed and our characters’ roles have been established for this second act’s more kinetic story; we have a struggle of territories and a struggle of trust. Both sides, human and ape, have taken causalities and their pasts are bleak and full of strife. This is the tipping point where the reality of the premise comes to a head. At the centre of this is the relationship between Caesar, the ape leader, and Koba, a scarred ape who was also given accelerated brain treatment in Rise. This conflict is incredible and is easily the driving force for the film’s second and third acts, Koba has memorable scenes in equal measure to Caesar in the first film. On the human side things are more formulaic. Jason Clarke plays Malcolm, a survivor and father who sees the possibility of peace between the two races, and Gary Oldman plays the humans’ nervous leader Dreyfus extremely well. But most of the characterisation for the humans only lies between Malcolm and Caesar, who both struggle to protect their families against uncontrollable dangers. It does continue Rise‘s faithful continuity to the original film; I caught one or two familiar aspects that should grow in importance as time moves on around our characters. The CG effects and motion capture here is stunning. Really stunning. The lighting and animation of these animals during all kinds of events, rainstorms and infernos, is really something to see. Koba himself is portrayed especially in a terrifying light! You are properly away with the premise, occasionally I would think: “I’m watching two monkeys beat the snot out of each other… and I am completely invested in it!” but then the success of such a premise lies in the technical execution, and it definitely succeeds here! For a 12A, I must admit, this is a grim and scary film. While Rise established Caesar and global events, Dawn goes for the jugular and is probably the most intense 12A I have seen since The Dark Knight. It isn’t as compelling as its predecessor. It feels ever so slightly too long: the second act feels quite padded for time with some repetitive scenes. Why explain something twice when you can do it once with more efficiency? Certainly Rise‘s subtly isn’t present; this is a blockbuster designed to have you at the edge of your seat, and I certainly was! I highly recommend it! I love a good villain and Koba has been building up to this since Rise, and as a sequel it has paid off awesomely. What it lacks in subtext it makes up for in sheer brutality and emotional intensity. Additional Marshmallows: Ah yes, the 3D. I wouldn’t say you need to see this in 3D, although the effect didn’t detract my enjoyment at all!